In 1970, a magnitude 7.9 earthquake in the Peruvian Andes caused a large mass of ice and rock to separate from a vertical face on Nevado Huascaran, the highest peak in Peru. The slab fell 1000 m vertically, disintegrated, slid down the lateral slopes of the mountain, and then was launched off a 'ski jump'. At this point a mixture of pulverized rock and melted ice, the debris reached a velocity as high as 280 km/hr. It split around a small hill and buried the towns of Yungay and Ranrahirca, having traveled 11 km horizontally in about 4 minutes at a mean velocity of 165 km/hr. The death toll in both villages was 20000. Southern Peru was rocked by an eartquake measuring 8.1 on the Richter scale on June 23. About 75 people were killed and another 68 missing, as of mid-July 2001. Nearly 200,000 were made homeless. These problems were compounded by strong aftershocks that knocked down weakened buildings and hampered relief efforts. This quake was the most powerful since the 1970 quake when 70,000 people were killed in ensuing mudslides in Huaraz in the central Andes. It registered 7.8 on the Richter scale. Damage was estimated at approximately $1 billion, and about 1 million persons were left homeless. 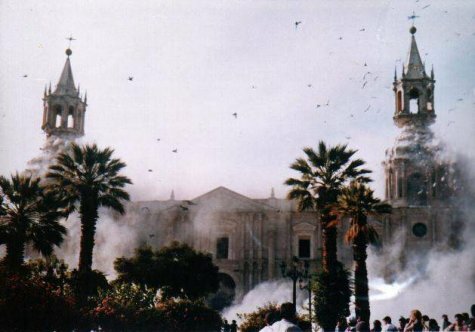 One of the worst hit areas was Arequipa, Peru's second largest city famous for its colonial architecture built with volcanic rock. The oldest buildings were especially vulnerable to the quake. Details on the June 23, 2001 quake ::: Tsunami Report ::: More stuff and more links.